Noted producer Jerry Weintraub died on July 6 in Santa Barbara at the age of 77. 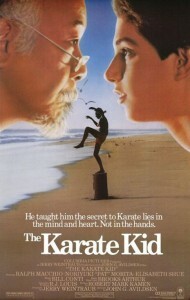 Poster for the first “Karate Kid” movie. Morita said in a 1986 interview that he was billed as Noriyuki (Pat) Morita in the film because Weintraub wanted him to sound more ethnic. Noriyuki was Morita’s given name. The first “Karate Kid” earned an Oscar nomination for Morita and rejuvenated his career. In a 2011 interview, Weintraub said he was reluctant when approached by actor Will Smith about doing a remake of “Karate Kid,” which is regarded as a classic, but was persuaded when he saw the script. Set in Beijing, the new version starred Smith’s son, Jaden, and Jackie Chan as his mentor. Weintraub produced TV specials for Frank Sinatra, John Denver, Dorothy Hamill, Neil Diamond and The Carpenters; produced tours for Elvis Presley and Bob Dylan; and managed such singers as the Pointer Sisters and Dolly Parton. 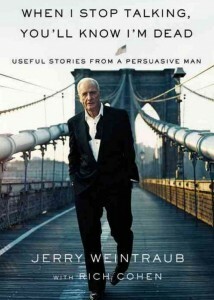 Weintraub’s most recent TV credits as producer or executive producer include the Liberace biopic “Behind the Candelabra,” the climate-change documentary series “Years of Living Dangerously,” and the political comedy series “The Brink.” Two of his projects, the science fiction TV series “Westworld” and a “Tarzan” movie, are in post-production.